If you could make your own energy, what would you do with it? With Nissan Energy Solar we’ve combined world-class solar panels with our intelligent energy storage system to create an everyday energy system for you and your family. With Nissan Energy Solar you’re in control. You can harvest the power of the sun to generate clean energy with solar panels, store it with xStorage and then use it to power what you love - day or night. Your home, your electric vehicle, your life. See below how we’ve used it to help power the most remote recording studio in the UK, and an independent cinema in London. Now it’s over to you to power your passion and #ElectrifyTheWorld. Nissan Energy Solar is a portfolio of energy generation and storage solutions for your home or business, allowing you to contribute to a cleaner environment and, whilst saving, build a more sustainable future. 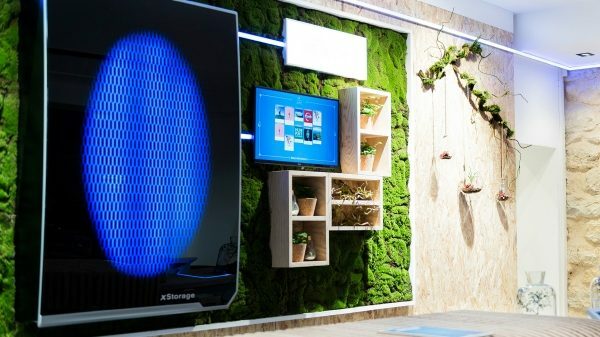 Nissan xStorage Home allows you to take full advantage of the latest in sustainable energy sources, whether they’re solar panels in your home or pedals in a café, to power the LEAF battery module at the heart of the xStorage Home unit. Our free dedicated app puts you in control and allows you to track your solar energy storage and consumption in real time. You can even switch from stored to traditional power at the touch of a button wherever you are. Start driving the car of the future and a pillar of the electric ecosystem today. Nissan’s pioneering range of 100% electric cars and vans offer top class performance and cutting edge technology, allowing you to enjoy the ride, whilst producing zero emissions while driving. Nissan's vision of a more sustainable future starts with our zero emission vehicles, but it's much broader. We're shaping the idea of smart cities running on clean energy. We're expanding charging infrastructure, promoting car sharing, and more. Join us as we act to make greener living easy, accessible and even fun. Enter a few simple details and we'll keep you up to date with our electric vehicles, our electric ecosystem and what we’re planning to do next. Let's Electrify The World together! There is an ever-expanding, exciting range of innovations being spearheaded by Nissan. From our emphasis on zero emission technology both in and out the automotive industry, Nissan are proud to say we are the undisputed pioneers in Electric.